UPDATE: I have now been able to decode the FDR file for American Airlines Flight 77. The decoder and output files are available here. 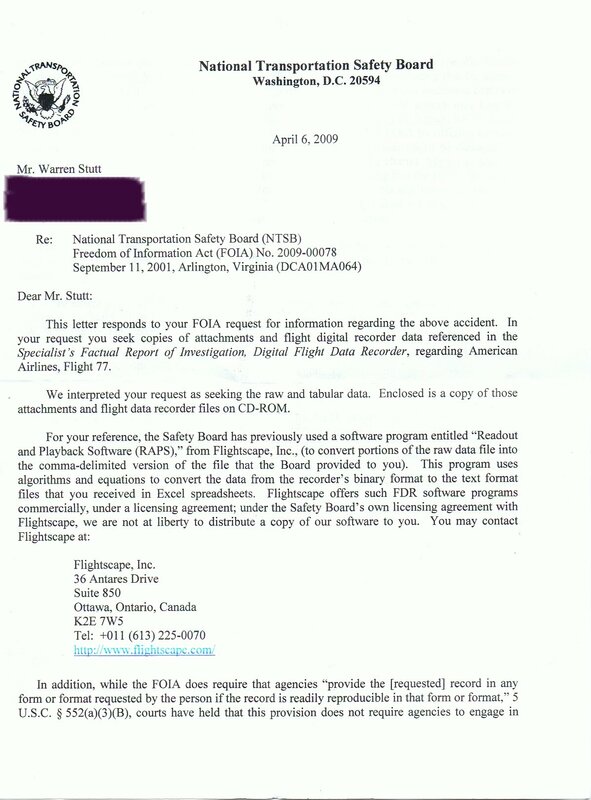 On 2nd January 2009, I sent a Freedom of Information Act (FOIA) request to the United States National Transportation Safety Board (NTSB) through their online request web page concerning the Flight Data Recorder (FDR commonly called "black box") file for American Airlines Flight 77 (AAL77). My aim was to get a copy of the original FDR file which is compressed, a decompressed copy of the file and the data frame layout used in the file. I received a CDROM containing the data frame layout and a copy of the original FDR file, however what I was most wanting was a decompressed FDR file. Now that I have the data frame layout, I would be able to decode it. The data frame layout (757-3b_1.txt) is available here. There is also a file D226A101-3G.pdf which is a Boeing document containing generic data frame layouts and information on how parameters are recorded which is available here. 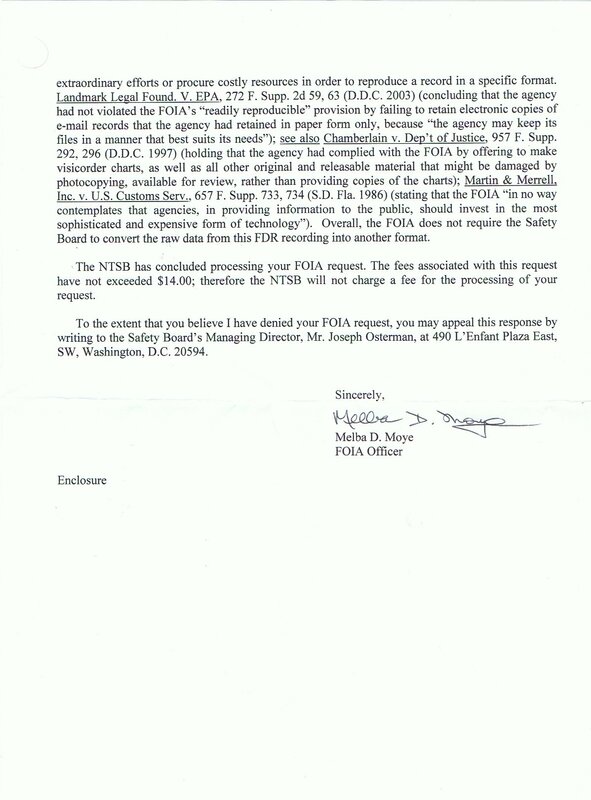 The NTSB appears to have mostly used the D226A101-3G.pdf Boeing document to generate their Comma Separated Value (CSV) file. My request involves NTSB Number DCA01MA064 which is the crash in Arlington, Virginia on September 11, 2001 of the B-757-200 aircraft registration number N644AA operated by American Airlines. Footnote 1 on page 2 of the "Specialist's Factual Report of Investigation Digital Flight Data Recorder" document of January 31, 2002 made available online by the NTSB at http://www.ntsb.gov/info/AAL77_fdr.pdf refers to Attachments IV and V: Boeing Document D226A101-3, Rev G, October 27, 1999 (D226A101-3G.pdf) and American Airlines database printout (757-3b_1.txt). I request a copy of each of these attachments. Page 3 of the same "Specialist's Factual Report of Investigation Digital Flight Data Recorder" document referred to above states "Prior to recording, the serial data stream is compressed using a modified Hoffman encoding scheme. The data can be decompressed and restored to the original ARINC 575/717 format without any data loss. This requires the use of specialized manufacturers or equivalent software". I request a copy of the data as recorded by the SSFDR and a copy of the data after it has been decompressed by the required software. I make this request as a private New Zealand citizen permanently residing in Australia; however I am prepared to make the information I have requested publicly available on the internet. 08/09/2007 08:22 AM <DIR> . 24/03/2009 10:13 PM <DIR> ..
08/09/2007 08:22 AM <DIR> ..
21/03/2007 06:43 AM <DIR> .